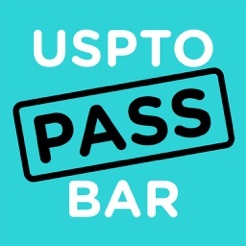 If you are a law student or anyone else planning to take and PASS the United States Patent and Trademark Office (USPTO) Registration Examination in 2017 you need this indispensible exam study and prep app. 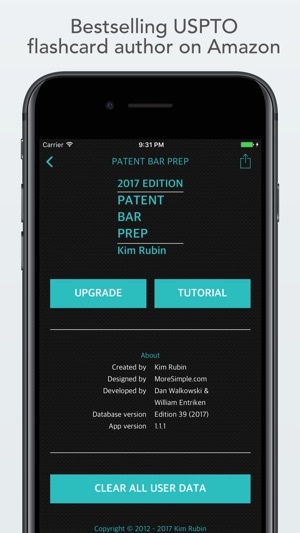 Using the same Question and Answer format from the best selling Patent Bar Exam Study and Review Flashcards 2017 Edition by the same author, available on Amazon, the app provides both technical content and an organized study methodology for easy learning and steady, positive review. All information is completely current with the USPTO’s registration exam study material for exams given in 2017. Material includes: court cases Bilski, KSR and Alice; subject matter eligibility under §101; Post Grant Review and recent Examination Guidelines. Study material is presented as flashcards. Each card has a simple question on the front and a straightforward answer on the back. A tap flips the card. A swipe moves forward or backwards through the deck of cards. 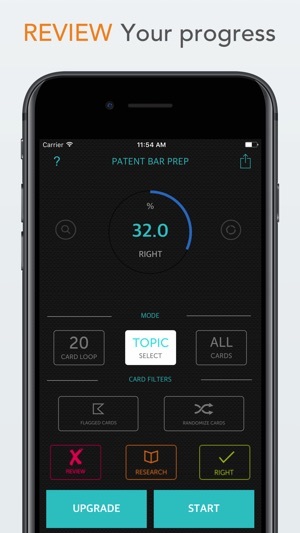 After looking a card, you decide if you know the answer to the question, and then tap a RIGHT or WRONG button, or simply move to the next card. The free app provides core concepts in 100 cards. 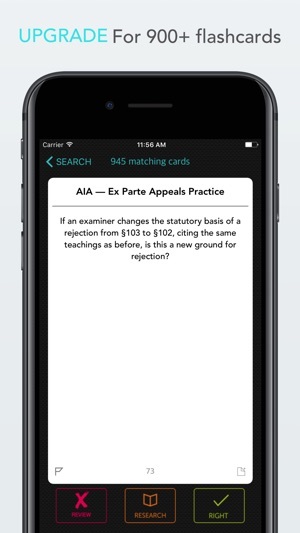 An in-app purchase provides approximately 930 cards for a full study set. 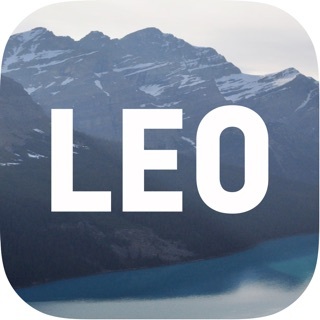 The free app provides all the features of the full study set. Questions are organized into about 304 searchable topics, in the full study set. You may add your own notes to cards. To aid in studying, you may mark each card as RIGHT, REVIEW, or RESEARCH. Your marks may be used to filter cards viewed. For example, you may select only cards marked REVIEW, typically to review only material not yet mastered. In addition, you may also independently FLAG any card. 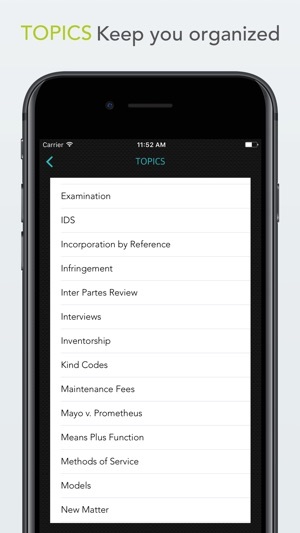 You may search for topics, text in a Question or Answer, or by card number. Statistics are clearly displayed on the home screen, showing what percent of cards viewed you have marked RIGHT. Also shown is what percent of all cards in the deck are marked RIGHT. These percentages allow you clearly see your study progress. Cards are presented in 20-card groups, if desired. Reviewing a 20-card block until all 20 Questions are mastered is a proven way to learn and remember technical material. 20-card groups also provide a convenient way to break learning into manageable chunks of time. Alternatively, you may select a study group to be all cards on a single topic, or simply move through the entire deck. At first, cards are presented in order, with all Questions and Answers on a single topic grouped together. Later, you may select RANDOMIZE. In the USPTO exam, questions are presented in random order. Each card provides a reference to the law (U.S.C Title 35), regulations (37 C.F.R. ), or a section in the MPEP. Material in the cards is now in Edition 38. The author is an experienced Registered Patent Agent and public speaker on patent topics. We love hearing from students! If possible, we will answer specific questions related to the material. Very easy to use and I finally don't need to bring the FlashCards with me anymore! Well organized, efficiently presented content, with filters, flagging and subsets. My success rate has improved after just a few days. Recommended. Super easy to study. Up to date and intuitive.